– Visit restored 1891 Dooly County Courthouse on Vienna’s town square. – Visit open-air tabernacle built with hand-hewn timbers more that 110 years ago. – Tour United States Senator Walter F. George Law Office Museum. – Tour historic Vienna Cultural Center, formerly Prince of Peace Episcopal Church. 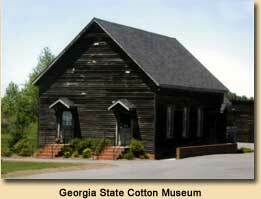 – Learn about Cotton, Georgia’s #1 crop, from seed to finished product, at Georgia’s Cotton Museum. – See restored historic Lilly School, home of Dooly County Arts Council. – Shop specialty shops for antiques, crafts and collectibles, and consignments. – See historical homes and structures on a driving tour of the community. – Visit local pecan grower and learn how pecans grow and how they are harvested, processed, and shipped all over the United States. – See BBQ City, U.S.A., home of Georgia’s Official Barbecue Cooking Championship, BIG PIG JIG ® . – Enjoy finest of southern cooking at local restaurants. – Spend cozy nights at our local B&B.